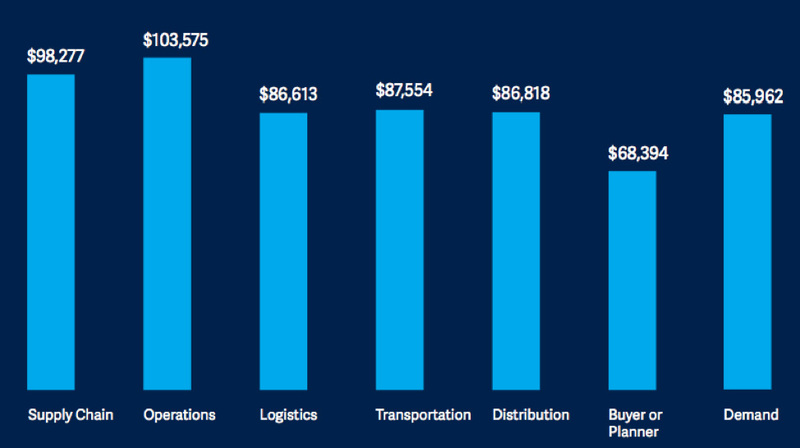 First off, here is the figure that everyone is curious about: The average salary for U.S.-based supply chain professionals last year was $85,210. This number, along with a wealth of new data on salaries, benefits and career satisfaction in the supply chain sector, comes from APICS’ first annual Supply Chain Compensation and Career Survey Report. More than 2,600 professionals took part in the survey. About half held positions at the associate level, while 42% were managers and 11% were at the C-suite, VP or director level. More than three-quarters hold an undergraduate degree or higher, and more than half have been in the supply chain industry for at least a decade. Most of the surveyed professionals reported that they earn salaries of between $50,000 and $130,000, which are the 10th and 90th percentile in this sample, respectively. The vast majority (90%) also reported a salary increase, the average of which was 3%, which is in line with broader cross-industry averages. A lucky 8% boasted a 10% or higher salary increase, while 10% saw no change or a decreased salary. As one would expect, average salaries steadily increase alongside the number of years someone has worked in supply chain. Those with fewer than two years of experience have salaries roughly around $63,000. 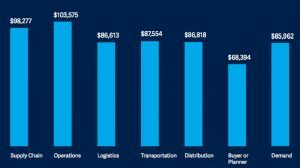 This increases to an average of $76,327 for those who have been working in supply chain for five to nine years, to $90,779 for those who have 10–19 years of experience, and to $103,535 for those with 20 years or more in the industry. If you have the words “operations” or “supply chain” in your job title, chances are your salary is higher than professionals whose job titles contain the words “buyer” or “planner.” The chart below shows how salaries differ by job title keyword. Of course, it is worth noting here that these keywords correlate with job tenure. Another notable finding is a gender pay gap that persists even when the salary data is disaggregated by job tenure, as the chart below shows. Overall, the average salary for men working in supply chain is $90,025, in contrast to $77,772 for women. While around 97% of respondents across company sizes reported that they receive PTO and more than half have the option of flexible schedules, other benefits varied. Among respondents who were employed at companies with fewer than 100 employees, only 53% have paid family leave benefits, compared with 82% of those employed at companies with 50,000 or more employees. Respondents employed by large companies are also more likely to have professional development support, from tuition for continued education to in-house training to conference attendance. Overall rates for these benefits fall between 50% and 70%, with tuition support being the most common, at 69%. Overall, respondents to the APICS survey indicated that they are satisfied with their careers. On a 0–0 scale, 10 indicating “very satisfied” and 0 “not at all,” the average score was 8.4. Respondents were also asked about the likelihood of their staying in the supply chain industry in the next five years. The average rating was 8.6. Career advancement, higher compensation and escaping a negative office environment were the top three most common reasons for leaving a job. Employees who are under 30 are most likely to leave in pursuit of professional advancement and a higher salary.